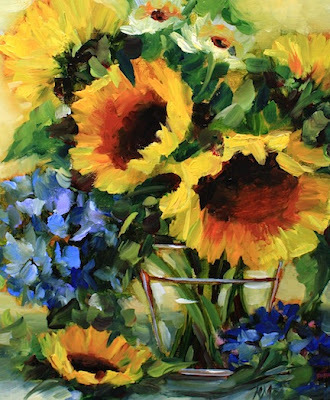 October Moon Sunflower Blooms is drying on the easel in Flower Mound Studio after a very busy day at the Dallas Arboretum. I spent the day painting with 13 of my students in the Education Center. This was my first big class at the Arboretum, so I was a bit nervous yesterday evening as I packed up my supplies imagining the worst - would I drop my paint? Would I call green yellow? The only foible was the absolute collapse of my work easel at the beginning of class. It seemed a vital screw had come loose, and rolled away into the dark under a large piece of furniture in the classroom, never again to be retrieved. Some might compare that loose screw to a few of my own personal loose screws, but the Arboretum staff came to my rescue, and brought me a great easel within minutes to save the day. As the ladies and I painted away, families traipsed by the plate glass windows, taking picture of their children around the stacks of pumpkins and mums of every color. What a perfect day! My class filed up so quickly, the Arboretum PR director has asked me to teach again in the spring. I'll be lining up a three day workshop then, and I also have classes here in Flower Mound studio for those who would like a smaller setting with the occasional pug underfoot to keep things interesting. Stay tuned on my Web site for dates for upcoming workshops. I can't tell you what an honor and a thrill it is to be asked to teach at the Arboretum. 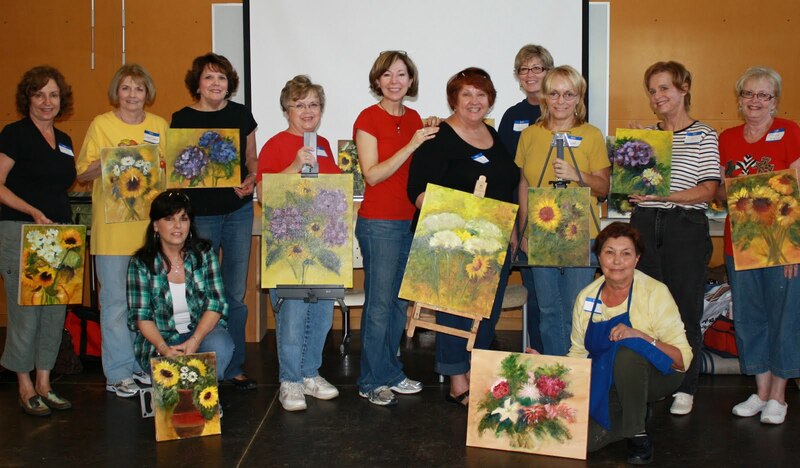 Imagine having a classroom for flower painting in the most beautiful garden in North Texas! I'm a very lucky gal. Saying cheese with my students! What a fabulous and fun day this sounds to have been, with the exception of the errant screw, of course. The paintings the students did came out beautifully too! Love your work, as always, Nancy! Hi Nancy - looks like a great group of students and wonderful paintings from their day with you. I am glad it went so well! Martha thank you, I was a candidate for that deodorant commercial, sweating bullets when my easel fell apart. Rest assured that thing is in the trash now!!! I think it sounded like an awsome day to share with others. your students were so lucky to be in your class! it is on my wish list to come and learn from you one day soon!